I went to watch the movie “The Help” with some other people in my programme yesterday. The movie is very good, but one scene made my mind wander and would eventually result in this insomnia-induced blog post. The main character’s family (and domestic help) all gathered in the living room to watch the news of JFK’s death. Being in the States on the tenth anniversary of 9/11 prompted a similar reaction in my head, as I tried to piece together the last ten years of my life in relation to the various events of History I have had the fortune to witnessed. I am putting on my boy scout uniform (ha, now you know my dirty secret!). In my town the boy scouts are responsible for providing a human cordon for a religious procession that takes place every year. It’s a sticky late summer afternoon and at 3 pm I am watching Ally McBeal on TV. I am already indifferent to the Catholic Church and its obsolete rituals, but for the sake of tradition I just put that uniform on. It is around 15:45 pm and we are late. The Ally McBeal episode is interrupted by news footage of planes flying into the twin towers. I do not think much of it, it all seems distant and surreal to me so I just hurry up and leave the house. 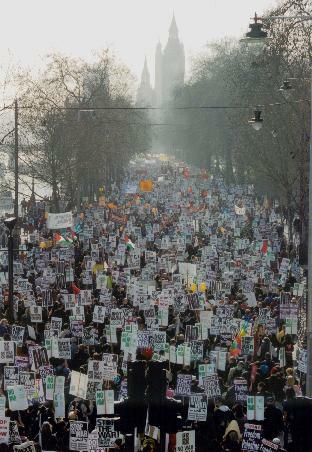 I was studying in Wales and kids in my (very liberal, tree-hugging, fantastic) school organised buses to join the anti-Iraq war protest in London. The other students are all more politically aware than me and more outspoken against the Blair-Bush decision to invade Iraq. I am really puzzled and do not know what to think. Having grown up in a politically-conservative family, my political journey towards the left had been one of self-questioning a lot of what I had been taught and exercise critical thinking. I was jealous of my friends for their unshaken beliefs. On 15 February approximately one million people went down to protest in London, the biggest protest ever recorded in the history of the city. On that day, it is estimated that between six and ten million people around the world protested against the decision to invade Iraq. I was one of them. I finally managed to get an internship in an international organization. It is my first day and my supervisor is showing me the ropes. As I sit at my desk doing a press review of regional newspapers, I can see the waiting room where five/six families of Iraqi refugees are waiting for their resettlement interview to go to the United States. I suddenly feel like history is not something you just witness on TV. I remember all the doubts I had when I marched in London four years before. I was right, but I did not know it back then. I have always thought of myself as a pacifist. It seemed a pretty obvious thing to me. Whenever asked, I would just say that war is wrong in that it violates the sanctity of human life. It had all been a purely intellectual exercise, that pacifism of mine. 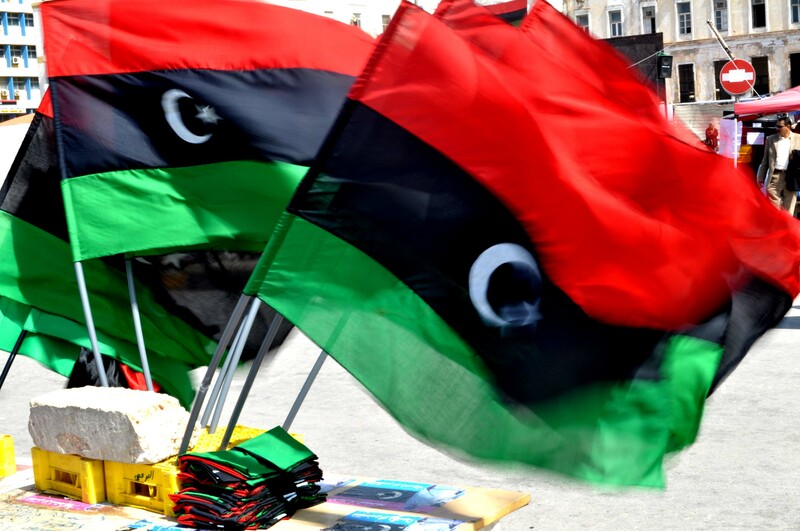 I am working in a transit centre for displaced people in Libya. It’s Easter Sunday and we have a bit of a management crisis. The camp is full to over twice its capacity and people are getting edgy. I call my family to wish them a Happy Easter and to tell them that everything is ok. I ask them what they are having for lunch and I secretly wish I could be there. I feel bad my parents are worried about me. A few minutes later my colleague and I are sandwiched in between one hundred angry people and a security man armed to its teeth. We try to talk to the people to diffuse the tension and avoid that the security man starts shooting his machine gun into the air, just like he did a few minutes ago. I am standing right in between them and this man, his machine gun twenty cm away from my face. Unarmed people keep pushing me towards the machine gun. I finally know why I am a pacifist. You put a weapon in a person’s hand and he/she thinks they are God’s gift to the planet. It is the ten-year anniversary of September 11. It’s all over the news. The day goes by in a haze because I have one of the worst hangovers of my life. I am barely able to process things. I quickly look at the walls of my Facebook friends, people I have met in the past ten years. For some of them 9/11 was the day America lost its innocence, they mostly leave in the West. For others it was the trigger of a spiral of death and hate, they mostly leave in the Middle East. My friend C says “Number of people killed on all sides during or as a consequence of 9/11: 131,000 (low estimate). If I had to go in front of God or a Galactic Council as a representative of humankind and justify this, I’d be ashamed“. For me, 9/11 marks the tenth anniversary of the day I became a pacifist.